I wanted to share Will’s birth story. It’s a practice in faith and healing. I guess I should start before we found out we were pregnant. Two years ago we decided we would like to have one more baby. We spent 6 months trying to get pregnant and finally did, but then at 21 weeks we lost the baby. We went through a stillbirth, which forever changed us, and we will never forget our little Andrew. We went through some testing after that and the doctor’s didn’t have good news. They told us they didn’t know why we lost Andrew but they were doubtful we would ever be able to get pregnant again due to our test results and if we did we likely wouldn’t carry the baby to term. I accepted that, after some time, and were moving on with life. 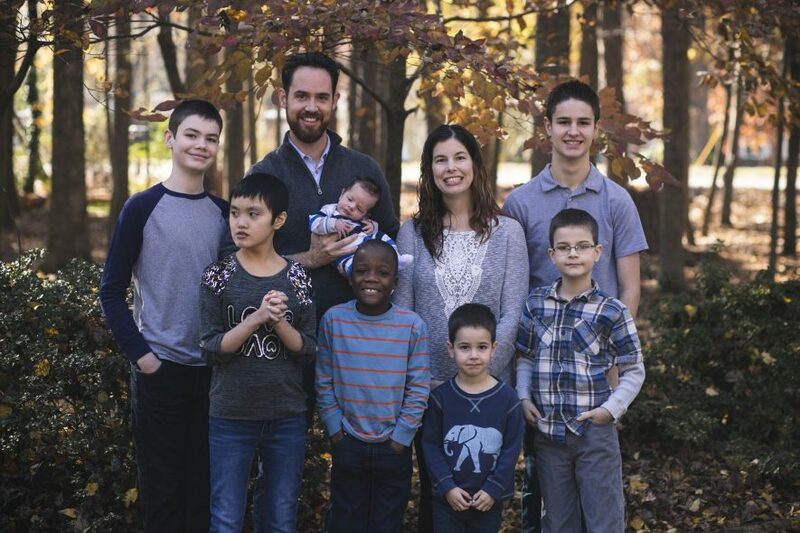 We had 6 wonderful kids and we were thankful. My mom had just moved in with us and was requiring constant care, so I saw God’s hand in the timing of it all. Then, in February, I started having some symptoms that suggested I might be pregnant. I was in denial about it but decided after a few weeks to take a test, which turned positive. I was shocked to say the least. I decided I wouldn’t tell anyone just yet because honestly I didn’t really believe it myself. A few days later my mom went into the hospital for the fourth time in 6 months and I started bleeding. At that point I just accepted it was another miscarriage and was thankful it hadn’t lasted long enough for me to get too attached or have to suffer another stillbirth. I know that sounds jaded but when you have lost four pregnancies you get to this place. I went to the doctor to confirm what I thought was the case only to have them tell me that everything with the baby was fine but I had a hemorrhage in my uterus that was causing the bleeding and could cause a miscarriage. So, I went home to wait and see what would happen. They didn’t give us much hope given our history. Weeks went by and the bleeding continued and everyday I wondered if it was the end, but the pregnancy continued. Around 9 weeks I prayed for healing one Sunday and the bleeding got worse. The next day I went to the doctor for an ultrasound and they said the hemorrhage had healed itself and the baby was just fine. We were cautiously optimistic at this point, because we had lost two babies in the second trimester before so we never feel “safe”. Around that time, my mom got sicker and had to be put into a nursing facility. I was stressed to say the least and my legs started itching. I went to the doctor and they ran blood tests and determined it was anxiety. Great. Fast forward to 18 weeks pregnant. On a Monday in June my mom was ushered into the presence of the Lord. On Tuesday morning we had another ultrasound and found out we were having a boy. This did not surprise me. A few weeks before I found out I was pregnant I had a dream where I was talking to our Pastor’s father who was very sick and on his deathbed. I told him I was pregnant and it was a boy and we would name the baby after him and Glenn’s grandfather and also my cousin, the baby’s name would be William Travis. We were overjoyed after the ultrasound that the baby was healthy and they went to plan mom’s funeral. The ups and downs of this season have been immense. Fast forward again to 36 weeks pregnant. They had done many many ultrasounds and tests up to this point because of my history and so far all was well but this whole time I continued to itch and it was increasing. Finally they did a blood test and determined I had Cholestasis of Pregnancy. It’s a rare liver disorder that affects pregnant woman where your liver just doesn’t work right and causes lots of serious problems but also itching. Due to the seriousness of the condition for myself and baby Will, they told me I would need to be induced at 37 weeks, that was in just one week. Given what I had been through, this stressed me out to say the least. I was nervous when we went into the hospital on Sunday October 14 for my induction. I had never been induced before and then my experiences in hospitals of late have been traumatic with Andrew’s birth and then my mom’s passing. This was complicated emotionally for me. We arrived for the induction and I was already contracting. I thought that was great news, but it wasn’t. They couldn’t use the regular medication they would like to use to begin an induction because of my contractions so we had to go a different route which might be slower and hopefully would not effect Will negatively. I began the medication around 9pm on Sunday and had contractions every 2 minutes until around 2pm Monday afternoon at which time I asked for an epidural because they were going to break my water which I knew from experience makes the pain much worse. I was exhausted at that point and just needed some sleep. I was also not progressing very fast and knew it could be hours before he was born. At around 6pm Will’s heart rate began to drop with every contraction. They were very concerned. They started trying to turn me different directions and see if it would help but it didn’t. So, they decided to do a procedure where they put the amniotic fluid back around the baby to see if that would help. If it didn’t they would need to do an emergency C-section. I was quietly freaking out. Those of you who know me know I don’t make a big scene if I am stressed but you can see it in my eyes. My blood pressure sky rocketed and I knew I needed to get myself under control before I made this situation even worse. I prayed and took lots of deep breaths and it stabilized but Will was still in distress. The doctor told me we needed to deliver this baby as soon as we could, but I was only 6cm at this point. I prayed and prayed and an hour later I asked them to check me again. The nurse thought I was crazy because there was no way I was ready to deliver in just an hour, but she was shocked to discover I was. I began pushing and within six pushes he was delivered. That is what a lot of prayer and determination will do of a mama who is terrified. I cried and cried after he was born, it had been such a long journey of loss to bring us to this point. When I got to the hospital and into the room where we would deliver I noticed the little baby warmer in the corner. When we had delivered Andrew there was no warmer, because there was no need. Over the next few days of being in the hospital I had many little moments of remembering Andrew and my mom. I ate an Italian ice that was the last thing I ever fed my mom. Just a million tiny moments of loss. Loss changes you. I will never be the same person I was before all this, but I hope I can honor their legacy by moving forward bravely and raising this beautiful child God has given us. William means “strong warrior”, this child is a fighter and he is strong with the strength God has given him. Loss makes you realize what you have. We do not take for granted the kids God has allowed us to raise. We also do not take for granted our typically developing children and the loss of raising a child with special needs. I was listening to a sermon on anxiety. I will not pretend this last year has been one that was free from anxiety. In fact had I not been pregnant I would be on anti anxiety meds for sure. It’s been a year. But this pastor said that we have anxiety because we confuse our responsibility with God’s sovereignty. God has given us the responsibility to raise our children but ultimately we are not in control of what happens to them, that is His sovereignty. I am not in control of their lives, that is God’s job. I get anxious by thinking I am in control when I am not. That is the biggest thing I am learning through all this. Let it go. God has got this whether I like the outcome or not, He has got it. And should the worst happen, He will see me through, because I will tell you sometimes the worst will happen. We have lived some of that worst, but we made it through because God gave us the strength to do so. And now we have a joyous moment in the midst of tears, because God has allowed it and we are thankful.